As I'm in my kids' school yesterday with our Induction of Officers I thought of taking a shot on this artificial clock used by the kindergarten class. We used the kinder class room to prepare the foods for the occasion and I just spotted this one for a photo hunt idea. 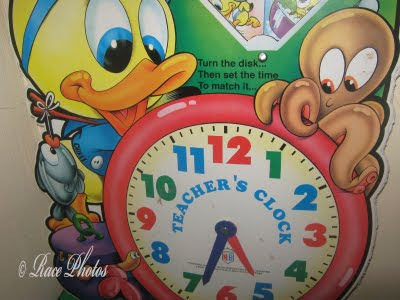 The teacher used this artificial clock to teach the basic of learning how to read the time. Well I had some pretty shots on other areas of this room and will save them for other themes. Happy weekend! Excellent concept...great photo. It's cute too! nice picture! a great way to teach little ones to tell time. Thanks for stopping by. Such a sweet take on the theme!! and great shot of the clock. I tried to make an artificial clock for my kids when they were learning time. It's harder than you'd think. Creative!! I made some fake clocks in my day, when my kids were small. Oh is it artificial, but it looks so real to me! That's a fun take on the theme!